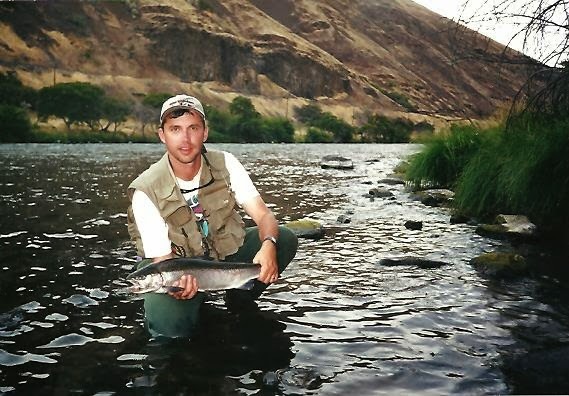 Fly Fishing with Doug Stewart: Fly Fishing Success with the Sun on the Water. Deschutes in a riffle with submerged rocks and boulders. One early afternoon on the Deschutes River, my friend Steve Dorn and I were riding in his jet sled looking for a place to fish. From past experiences we knew that with the sun on the water we had to be aware our position relative to the fish. If the sun is directly in the fish’s eyes it cannot clearly see the fly. Therefore, the casting position must be changed to give the fish a clearer view of it. You can move below the fish and cast upstream so that the fish has to turn away from the sun to see the fly as it floats by. You can also fish where the river curves, fish from the other side or nymph fish. We finally found a likely spot at 1:00 in the afternoon. It was a 50 yard riffle with large submerged rocks and it mellowed out into long run with large and small boulders. It was ideal holding water and the sun was behind our position at about a 45-degree angle. We were using 9 foot graphite rods and No. 8 weight forward floating lines. The use of sinking lines may also be effective because the fly is fished closer to the bottom. If fish were holding there our chances would be good. We weren’t disappointed because in the space of two hours we caught and released eight steelhead that ranged from 6 to 9 pounds. However, we didn’t realize that we had an audience sitting under the Alders on the other side of the river. Four guys had been shading themselves on the bank and they also had a boat. Secrets sometimes don’t last long on this river, so we took it in stride and gave it a proper name. It’s still called the Boulder Patch.